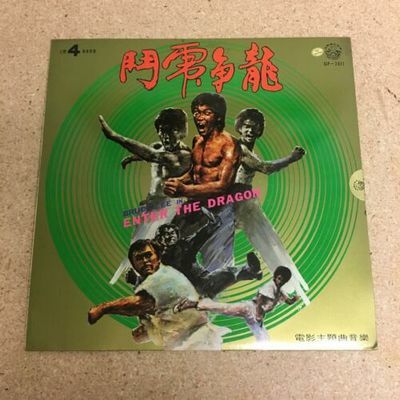 Bruce Lee in Enter The Dragon LP Hong Kong Action Cover Funk/Psych/Soul SLP-2017. Record is in NM condition with little to no visible marks in the original plastic bag inner sleeve. Cover is in VG++ to NM- condition with a slight crease near the bottom right corner. Great Rare Bruce Lee Hong Kong Record! SHIPPING DISCOUNT OFFERED FOR MULTIPLE PURCHASES ON SHIPPING - ADD $1.00 PER EACH ADDITIONAL LP SHIPPED WITH THE SAME ORDER IN THE USA, E-MAIL FOR INTERNATIONAL DISCOUNTS ON SHIPPING- THANKS - 26024 US Highway 19 N, Clearwater, Florida with over 35,000 records in our store along with 1,000's of CD's, music memorabilia, books, posters, etc.